Upon receiving the book, I was eager to begin reading it, so I packed it in the car on my way to take my three year-old to nursery school. I read the first to introductions pages at a stop light (one that usually take at least three minutes to change.) The small section I read moved me to tears. 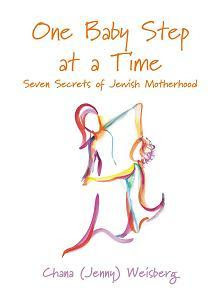 I think in part because Ms. Weisberg makes honest statements and as a mother of three children, five years-old and under, it is incredible for me to read that another mother admits that being a mother is the hardest job, that there are ups and downs and that she wanted to write a book to inspire and encourage Jewish mothers around the world. I found myself sitting down to write this review and realized that going back through the book, I marked many, many pages that inspired me. Almost too many to site for you in this review. To keep it short and sweet, and without revealing too much detail, the book provides SO many helpful tidbits and ideas to make being a mother easier. One particular section I found changed my outlook was the comment that the word "Mother" in a child's eyes is analogous to Hashem in an adult's eyes. Just as an adult would never want Hashem to turn away in their time of need, a child would not want his mother to turn away in his time of need. I read this section and in the same day my three year-old called out to me in the middle of the night. Admittedly, in the past, I have gone to check on him and sometimes, we just tell him to go back to bed. But, this time when he called out, I thought about the idea in the book, and I went to check on him and visit with him in his room. I could see in his precious eyes at 2 AM, that he really did call out to me and needed me at that moment it time. Truly a precious moment in time. In conclusion, Ms. Weisberg gives us an honest account of Jewish motherhood. In her collection of essays, tidbits and interviews, she shines light onto motherhood and also provides us a book to recommend to friends and family. I'm sure some people will tell you not to make it a "party" when a child wakes up in the middle of the night, but you, as a sensitive mother, know whether your child needs that special moment of closeness, or whether he's playing a game. (And maybe that game is his way of expressing a need, too.) I don't think you can err on the side of warmth and support. Know, too, that this phase is only temporary (it may be hard to take a long view when you have three kids of 5 and under, but trust me on this!). They really do wean themselves, sleep through the night, and learn to handle stressful situations confidently, on their own. But growth toward independence can't be forced. When your children outgrow the need for your reassurance and attentiveness, believe me, they'll let you know! Thank you SO much for your commentm, Shoshanna. I take each day individually and treasure the small things in life. I know the kids won't be little forever. I wish I had such a book in my day. And believe me, the laundry may wait decades to be folded. Whoever needs something will learn how to search or fold. Mothers don't have to do everything. My kids turn 40 and 41 next week and I still remember those sweet times at night being called for.